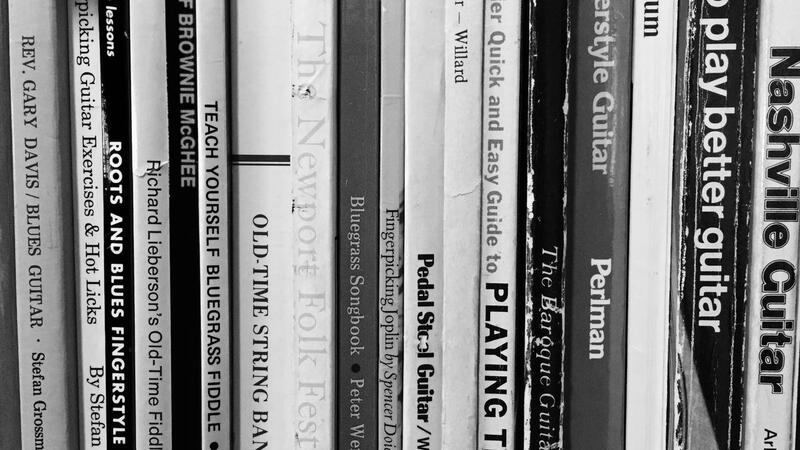 My old friend Paul dropped me a line this past week to ask about books on fingerstyle blues guitar. It seems he's got a student who's worked her way through all of my Fingerstyle Guitar Method book and is looking for what to do next. I wrote back with a handful of opinionated recommendations, realizing by the end of my message that this topic might be of more general interest as well. Although I use the phrase "general interest" advisedly. I played a show on Saturday night with a couple of songwriter friends of mine at Threadgill's here in Austin and after the show someone was nice enough to mention that she had been enjoying receiving my weekly emails. By her own description, she's more of a fan than a musician, so she tends to focus on the verbal buck and wing dance and just skim the guitar nerdery. Which is ok with me – it's an honor just to be nominated, and if someone's who's not even totally hung up on how to the play the guitar wants to know what I have to say, I couldn't be more, as they say here in Texas, tickled about it. That said, right now I'm going to cut to the chase with a cover version of my own email to Paul from last week. Here, for any of you in search of in-print fingerstyle resources, are a half-dozen recommendations, with relevant annotations, asides and caveats mixed in among the links. And then, more fundamental but really intuitive and helpful, I think, is Happy Traum's book on Brownie McGhee. I didn't encounter this book until much later, and I wish I'd seen it sooner, just because it takes some very simple ideas in keys like E and A and shows you how to groove and make a little music without getting into the weeds of a bunch of artist-specific licks or mountainous repertoire challenges. It appears to be only marginally in print and so may be a little hard to hunt down but I wanted to include it here for what it covers. That's it for now. I'm beginning to cross-post the weekly letter on my site, so if for some crazy reason you want to share with anyone, you can use the link below. And if you've got a favorite book of your own to recommend, be sure to chime in in the the Comments section below the post.